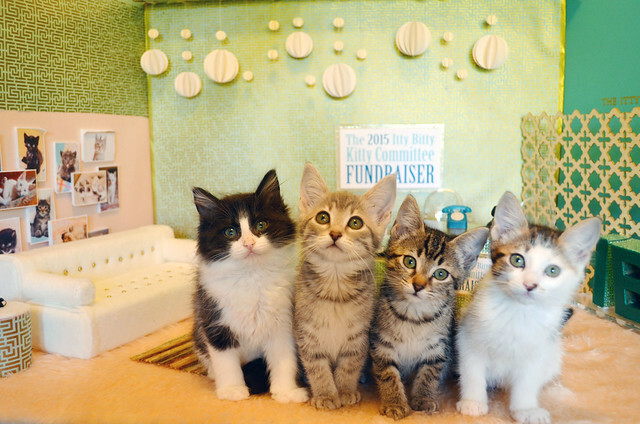 The Itty Bitty Kitty Committee: $159,096!! Woot, Woot and Thank YOU! $159,096!! Woot, Woot and Thank YOU! It took a long time to count up all those squillions, and I am beyond thrilled to announce that this awesome, big-hearted, cat-loving community of ours raised a remarkable $159,096 for the homeless cats and kittens this year! We still might have a little more trickling in, so it could rise a wee bit more. The whole event raised $300,155 and it makes me very proud that over half of that came from the IBKC Community! We received over a thousand donations from all corners of the world. These donations came from 11 different country and 46 states. We saw many familiar names in our lengthy list of donors and many new ones, too. I have to tell you, I was a little nervous going into it this year. Our goal was pretty big and we only had 17 days to meet it, which is half the normal length of our fundraiser. I asked a tremendous amount of you, scheduled some really huge matches for us to meet, and you got us there! And then some! I honestly don't know why I wasted a single second worrying - you all never disappoint. I should know this by now. Thank you for every single penny, dollar and squillion you gave. With this huge sum we brought in, we are providing the Humane Society with the resources to fund many wonderful programs and projects. I am so happy for the cats and kittens that will benefit from this. I'm happy for the shelter staff and volunteers who will put these funds to action and because of their devotion and hard work, will be able to witness many positive changes happen for the kittens and cats. I am happy for us knowing we played a part in all of it. Thank you for caring and giving so much. $159,096 is huge and I am mighty proud of our community. Your kindness and generosity is inspiring! I know there are many organizations out there doing incredible work for cats and kittens - we appreciate the fact that you selected ours to support. Thank you for believing in us and the mission of the shelter. And thank you to everyone for tolerating this long two weeks of me asking for support. I know it's got to get a bit exhausting at times seeing all of those pleas in your Facebook and Twitter feeds, and in my blog posts, too. I tried to provide some entertainment in the mix, but still, there were times when I know I saturated your feed with maybe too many requests for donations - especially when we were getting close to meeting a match. Thank you for understanding and not "unfollowing" us during this time. I would like to take a moment to thank some very special folks who contributed in big ways to the success of our fundraiser. Craig: Thank you for tolerating the madness once again. I know I get distracted by this annual event and let many things in life slide during this stretch. Thank you for not complaining and always being supportive. Thank you for listening to me talk about it all the dang time. Thank you, too, for making the beautiful painting of Charlene for our auction. Marguerite: Thank for always being available and so willing to help. I appreciate the many photos, stories and stats you shared with me. You made my work easier, and all you contributed to this fundraiser helped bring in many donations. Thanks for working hard and bring in lots! You both raised your goals and exceeding them, too! Way to go! Thank you for working hard to raise money for the kitties. Seeing such young people giving so much is inspiring to many. Keep it up, kiddos. You're special and we love you and your big hearts. All our human, feline, and canine friends who walked the walk: Craig, Shana, Jim, Blixa, Sarah, Bob, Allie, Lynn, Alex, Ruth, Stephenee, Kathleen, Hannah, Lisa, and Wylla. Thank you for generously donating a portion of your sales of your awesome products to support the kitties! Our auction winners: Thank you for your generous winning bids! Lynn and Alex, Rosemary, Gerard, Beth and Michael, Lisa and Stuart: Thank you for offering up wonderful matches and inspiring folks to give! Mary H: Thank you for offering up the kitty bed match and stitching up all the beds for the shelter cats! iPop; Thank you for donating the magnet sets for us to give away! Awesome Anonymous Donors and Anonymous Lover of Kittens: Thank you for the many huge matches. I will do the rest of my thanking of you in private, because I respect your wish to remain anonymous, but I will say publicly, that you are truly awesome and we wouldn't have met our crazy goal if not for your generous matches. We appreciate you and your huge heart so much. The way you give is beautiful, generous and inspiring in so many ways. Thank you for the many matches you offered. Without your support, we would have fallen far, far, far from our goal. You're our patron saint, and we love you. It is impossible to adequately thank all of you because what you've given is so huge. Please know that I appreciate you more than I could ever express. This community is amazing and unlike any other. You are good, good people and I hope your hearts feel as full as mine does right now. To our winners, please email us and let us know where we should ship your prizes! That's it for today, friends. I'll be back tomorrow with more adorable Hollis Girls and we'll see what happens when we set them loose to breakdown the set! Congratulations!!!!!! This is such exciting news and to think that 17 days seemed so short. The IBKC is the internet working for good- everyone has to feel nothing but happiness today. I have to run and go tell the kitties the great news. This is so exciting! Love these numbers ~ that's a lot of squillions and a lot of yays! It was a pleasure to walk with such generous and kind folks. Congratulations. Thank you Laurie for all that you do. This post moved me to tears. It's such a great community full of people who care about more than themselves and constantly restore my faith in humanity!! I'm so happy that so many kitties will be helped in the upcoming year with all the money raised during this year's FUNdraiser!! CONGRATULATIONS!! OMG, that is so fabulous, $159 Squillion in just 17 days!! That is just over 1/2 of the total amount the whole event raised this year! Can you all believe that! Thank you, Laurie, Craig, Charlene, Wylla and the rest of your team for such an amazing FUNraiser! Congratulations, Laurie! It was so much fun to watch the total grow and grow and reach new heights. And special thanks to Cynthia, whose love for kitties and enormous generosity are mind blowing and inspiring! Thank you for helping all these kittens and giving all of us our kitten fix without the broken fragile stuff! And for the opportunity to chip in to help make so many awesome things happen for the kitties of all ages! Thanks, too, for offering us an opportunity to give to a cause that we know is using the money wisely and for the good of the kitties. All good programs. The providing food to loving, but house bound or poor cat owners, really touched my heart. Congratulations! What a wonderful service you're providing -- both to the HS and to the kittens themselves! And to the rest of us, who depend on your blog for a shot of snuggly goodness throughout the day.